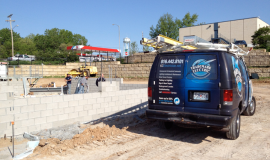 Trademark Electric is your top Kansas City Electrical Contractor focused on QUICK RESPONSE TIME and REPUTABLE service. We also offer extensive Lighting Contractor expertise and have excellent references in the Federal Contracting market. Trademark Electric offers a wide range of electrical services, but what unites every Trademark Electric project is the level of customer satisfaction we deliver. Our customer loyalty program ensures exceptional service is provided to each and every customer whether it be a commercial contractor or federal agency. Licensed, Fully Insured and Bonded! Trademark Electric is a U.S. General Services Administration (GSA) contractor. 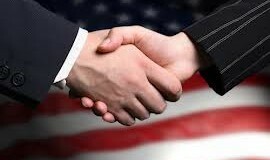 The government is one of our most valued clients and we proudly provide electrical and lighting services to federal, state, and GSA buildings and facilities. 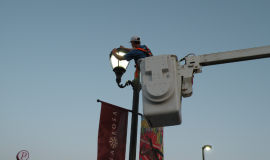 Trademark Electric specializes in commercial lighting providing installation, repairs and maintenance to all types of lighting such as parking lots, warehouse, and holiday lights. We have exceptional experience installing, repairing and maintaining commercial signs such as building signs and monument signs. We also specialize in energy efficient lighting such as LED and Induction.